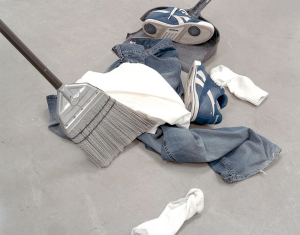 Ok, who loves cleaning all day long? If you answered “I do, I do!” then put down your phone or tablet and grab a sponge. If you’re like me, and you love a clean house, but would rather be doing something else, this might be helpful. I do not have a maid service or laundry service. I’m betting you don’t either. Even if you can make room in your budget, you’re still spending money on that instead of something fun. But, we only have a limited amount of time on the planet, and time is money too. So, what can you do? For me, the answer is this: I try to be efficient. Being an only child, I got first dibs on money for doing chores when I was little. But, like other kids, I wanted to spend my time goofing around. So, I’d hang around most of the day, and an hour before my mom got home I’d zoom around and clean the whole house. Now, my mom would probably question the quality of my work; but now that it’s my own house, I have a bit more incentive to do a better job. Gather, sort, and start the laundry. Move on to step 2, but periodically check the laundry to keep it moving. Fold immediately so it doesn’t wrinkle, unless you have the steam option. Pick a room in one corner of your house. Start by picking something up. Any one thing. Decide whether something belongs in that room or out of that room. If it belongs in the room, put it away. If it belongs in another room, put it outside the door in a pile. Put everything away that belongs in the room. Remember, pick something up only once and put that one thing away. Repeat steps 1-4 for every room in the house. As you move to a new room, take the things from the pile that belong in that room. With practice, you can survey the room and find multiple things to grab and distribute them on your way to the far side of the room. Finish up that laundry by folding and putting it all away immediately. I do this by again picking something up only once and folding it right away. I make piles of like things and then put those like things in sections of the laundry basket. Then, put things away one room at a time, as explained before. Now, every evening, take 5-10 minutes to pick up all the tidbits that are not where they need to be. Run the dishwasher, wipe the counters. If you do this, then you might find that you have more time on the weekends to do…well, things that are more fun! Do you have leftover bakery sub rolls? We did. This, according to Randy, is a great use for them. Quick french bread pizza. I agree! Set oven to broil. Arrange rolls on a cookie sheet, sliced side up. Place in oven 5 minutes or until lightly browned. Remove from oven. Spread sauce evenly over rolls. Sprinkle cheese over sauce. Arrange t0ppings as you wish (feel free to add or remove per your liking. Onion, bacon and green olive make for a great pizza). 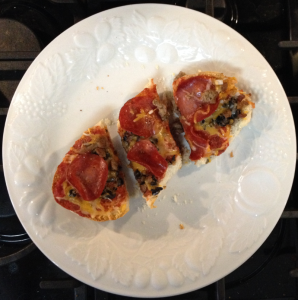 Broil pizzas for 7 minutes or until cheese is bubbly. Refreshing adult beverage time! This is a family favorite, brought to us by family friends in Mexico. I’ve changed the recipe slightly but I’ll share the original as well. Fill glass halfway with crushed ice. Add the Tequila. 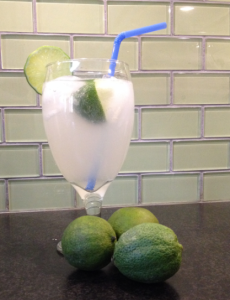 Squeeze lime juice into the cup then drop the lime in. Bruise the Tequila (that means to take the glass between both hands and twist the glass around until the contents of the glass becomes really cold). Add the soda. Poke the drink around with a straw and add the straw. Add a slice of lime for decoration. Enjoy! Did you get a Ninja for Christmas with the single-serve cups? No? Have a bullet? No? Well, just use your regular blender. This is really good. I have this for breakfast most mornings, it’s my favorite. 2 cups almond milk (I like Almond Breeze 30 calorie Unsweetened). 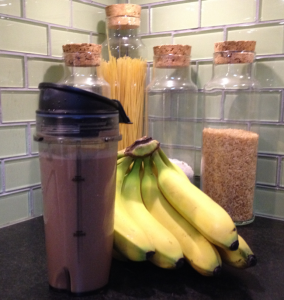 In your Ninja or Bullet single serve cup, or your blender jar, add banana and ice cubes. Pour almond milk over the cubes. Sprinkle Nestle Quick Powder over the top. Put the lid on the cup or blender jar and blend on high speed for 30-45 seconds. Makes about 20-oz. serving size. Yum. *Warning: Try this ONLY if you have good self control with credit cards. As a matter of fact, count how many times I refer to self control in this article. Ok, so you’ve paid off all your credit card debt with the instructions in Pay Off Those Credit Cards! and now you’re not sure how your money can work for you. Is your credit better? Do you have AWESOME self control now? If you answered no to either of these questions, then leave now and DO NOT finish reading this post. If you answered yes to both questions, then read on. Let’s talk about debit cards. 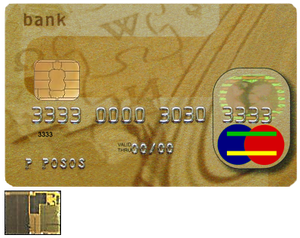 Debit cards are distributed by banks and allow you access to your money via ATM machines, usually with no charge at machines on your network, and double-charged by your bank and other banks at off-network ATMs. They also allow you to complete purchases at point-of-sale locations like grocery stores, department stores and gas stations, etc. What they don’t do is make you any money or earn you any rewards. Now, let’s discuss credit cards. I know, if you just got out of serious debt, credit cards are the last thing you want to talk about. And if you’re not comfortable, stick with debit cards. But if you have good self control and can pay your balance in full before the end of the month, you can get more mileage out of your credit cards while improving your credit score and take advantage of rewards cards perks as well. Here’s how. Again, please only try this if you have really good self control. Pick a Card – Pick one credit card with a limit high enough to cover your monthly expenses. I recommend choosing a card with either a large cash back reward or airline miles rewards you will actually use. Without the rewards, the only benefit to this method is a healthier credit score really. Might not be worth the risk. I don’t recommend choosing gift card or restaurant card rewards, because those can be lost or stolen, and don’t really provide a big benefit like cash back or travel. Charge Your Monthly Expenses – Instead of reaching for your debit card to pay your regular expenses, use your chosen credit card. Charge the Bills You Can – Instead of using your debit card or writing a check each month to cover utility and other monthly bills, use your chosen credit card. Note that some bills (like credit card bills) cannot be paid with a credit card. This is to help save us from ourselves, and many people need that. And, according to LaToya Irby from About.com, you shouldn’t charge monthly bills. Usually I agree. But for this program, as long as you have stellar self-control, I disagree. Pay Off The Chosen Credit Card Every Payday – That’s right. Every single time you get paid, immediately pay the entire balance on that credit card. See why it requires such self control? Again, I only recommend this if you are sure you can commit and will not get yourself in debt. Cash In Rewards – Now, just cash in your rewards. For cash back, I recommend you redeem as soon as you are able to ensure you don’t lose them. For airline miles, save them until you have enough to pay for one or more tickets. It’s possible to gain enough points to pay for a round trip for 4 in one year if you’re dilligent about this. I know. I did it! I can’t stress enough that the balance on the card needs to be paid in full every payday. This really is the best way to ensure that you’re not over budget. And look at your credit card statement before you check the balance in your checking account. That way, you can’t be fooled into thinking you have more money than you do. Remember, only try this if you fully trust yourself to pay your card off every payday. Bon Voyage! Pay Off Those Credit Cards! 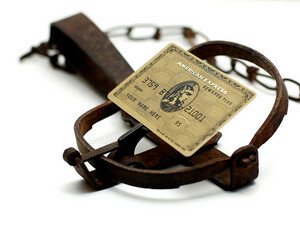 Stop Using Your Credit Cards – Before you can pay off your credit cards, you have to stop using them. Don’t close the accounts or anything like that. Just take a deep breath, use your willpower, and stop using them. Pick a Card – Figure out which card to pay off. If you have more than one card, choose the card with the highest interest rate. If the interest rates are all the same, pick the card with the highest monthly payment. Make Payments – First, pay all your regular monthly bills except the one card you picked to pay off first. ONLY the bills. Don’t go out to lunch or clothes shopping or anything else. Be sure to pay the minimum payment required on all the other credit cards. How much money is left in your checking account? Now, figure out how much you need to make it until you get paid again. Food, gas, and bare minimum needs. Subtract that from the balance of your checking account. I also like to leave a little cushion in case of emergencies, but don’t spend it. Whatever that leftover balance is, pay it to that credit card you selected. Repeat – Keep doing that until the card is paid off. Once that card is paid off, do it again with the next one. By concentrating on one card at a time, you accomplish two things: you focus your energy in one direction, speeding up the results, and you also free up the money that was used to pay the minimum payment on that one card. Now you can put that toward another card, thereby increasing the amount left over each month. This might seem restrictive, like going on a diet or giving up your favorite hobby, but once that first card is paid off, the sense of accomplishment can lead you to want to pay off more and more cards. If you find that you need more information than these quick tips, I recommend checking out Clark Howard or Suze Orman for more information. Looked in your closet lately? Want to wear that striped skirt but have nothing to wear it with? And why do you have 5 pair of brown shoes but mostly black clothes? That happens to me. It seems that with every season change some goblin has come and stolen half of the pieces I thought I remembered having. Since seasons are changing now, I thought I’d share these 7 steps to efficiently updating your wardrobe. Look Through Magazines – Before you even open your closet door, grab a copy of your favorite fashion magazine and see what people are wearing right now. It’s easy to get distracted by the over-the-top makeup, hair and clothing combinations, so I recommend you focus on the fabrics and the cuts of the clothing. Decide on Occasion – Wardrobes can sometimes become unbalanced, either heavy on weekend wear or chock full of work clothes. 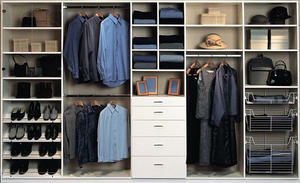 Inventory the Closet – Ok, take a deep breath. Open the closet door. What do you see? Try on everything. Every. Single. Thing. If it’s worn out, faded, ill-fitting or hasn’t been worn in over a year, toss it out. Seriously. See What’s Missing – Now survey the quality pieces left hanging. What do you lack to create the types of looks you enjoyed from the magazines? Take Pictures – Grab your cell phone and take a picture of the contents of your closet. Include shoes if you like. Make a List – Make a quick list of the items you’re lacking. Black skirt, tan shoes, etc. G0 Shopping! – Now hit the stores. Remember that stores like TJ Maxx and Ross are great for buying name brand pieces for less, although I recommend you remain focused. I also find that when Macy’s has a sale, you can save a lot of money. For staple items like camisoles for ladies or undershirts for men, you might save by going with store brands rather than name brands. It’s easy to get distracted by deep discounts on items you’ll never wear and don’t need. I would advise that you only buy items online if you are familiar with the brand and their sizing, or if you have special sizing that isn’t available in stores. Also, prior to shopping online, remember to search the store name with “coupon code.” I usually have success with RetailMeNot. Following these steps can help ensure you don’t waste money buying duplicate items or items that don’t complete the look you’re going for. Also, it helps you use pieces currently in your closet to create new looks. Happy Shopping! Running late? Got hungry kids? Here’s a quick recipe that’s healthier than take-out and easy on the budget. According to Randy, here’s how you make oven toasted ham n’ cheese sandwiches. They are good! Set oven to broil. Slice rolls and arrange 3 slices of ham on the bottom half of each roll. Place 1 slice of cheese on top of the ham. Arrange sliced onions to taste on each cheese slice. Spread mustard on the top of each roll. Place the bottom and top halves of the rolls face up on a cookie sheet. Place the cookie sheet on the top rack of the oven. Cook 5-7 minutes or until cheese is melted. Place the top of the roll on the bottom of the roll and slice in half. 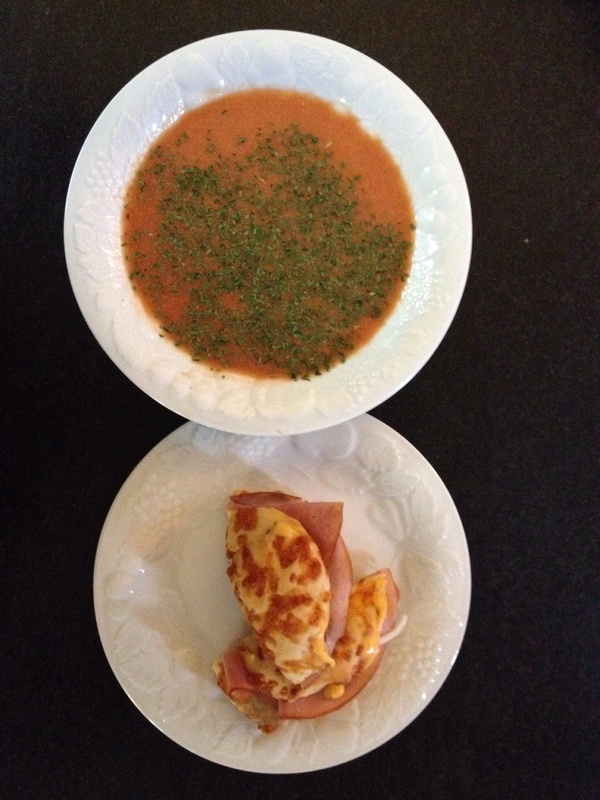 Serve with your favorite soup. My commute for the past four years has been at least an hour each way. Some days, it can honestly be two hours if traffic is terrible. Prior to that, I lived in Oklahoma and it took about 30 minutes to get everywhere in town, no matter where you were coming from or where you were going. But here in Atlanta, you should just settle in. For the first year or more, I decided that radio stations were the way to go, as had always been the case for me. 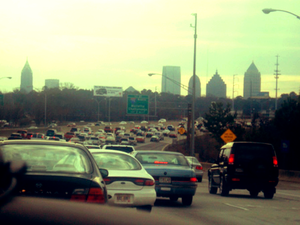 But I quickly learned that the bigger city of Atlanta did not translate to more music I wanted to listen to. It mostly translated to, in my opinion, more of the same. After a while I tried talk radio. And that worked for a while. I found I was getting some new information; however the information I was getting was only occasionally on a topic I was interesting in learning more about. Then, I thought I’d try satellite radio. For a few weeks it was a blast listening to old tunes from the 80’s and 90’s; however, as the days went on, I found myself bored yet again. Then, after chatting with a colleague, I came to realize that audiobooks were a possibility. Ten or more years ago, I happened upon a radio broadcast on a cross-country trip where an audioplay was being broadcast. I remember being drawn in by that experience, and feeling almost exactly like you feel when you curl up with a good book. Now, I can’t tell you the last time I had a chance to curl up with a good book. Not with twin preschoolers at home! So, I decided audiobooks might be interesting for me. The Library – I like to try free options before I commit to any monthly fee or per-book costs. What I found was that the Georgia Public Library uses a system called OverDrive that allows residents with library cards to check out audiobooks online, for FREE. So, I went to the library, got myself a library card (hadn’t had one of those since I was 12 I think!) and used the instructions to download the Overdrive app on my phone. A neat bonus is that there are no late charges! When the designated check-out period has ended, the book is simply removed with the push of a button, and that’s that. Audible – I signed up with Audible and have been satisfied with the experience. They typically offer one free month of service, and that gets you one free book. Then, each month after that you pay a fee which covers one book per month. If you want to read more, you pay more. So far, between Audible and the library, I’ve read more than 60 books in the past 12 months! I know, that sounds crazy. But between elliptical time and commute time, it seems to fly by. And I’ve found that I can get by with one audible book per month and supplement with the library. That says quite a bit about the lending selection, because I only check out the nonfiction titles, and in my experience those are typically more limited than the fiction book selection. I haven’t checked out other options, but it seems that these two can get you pretty far. If you have a long commute on the train or in your car, consider audiobooks. I feel smarter this year than I did last year, and I’m rarely frustrated by my commute anymore. It’s sort of like free college, without the tests! Need a Hotel? Try a Vacation Rental Instead!